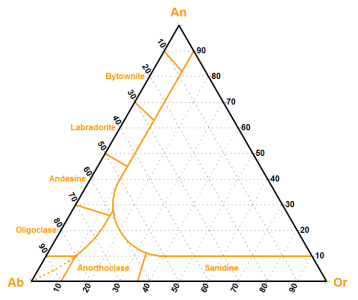 A triangle plot (also known as a ternary plot), is a graph of 3 variables. 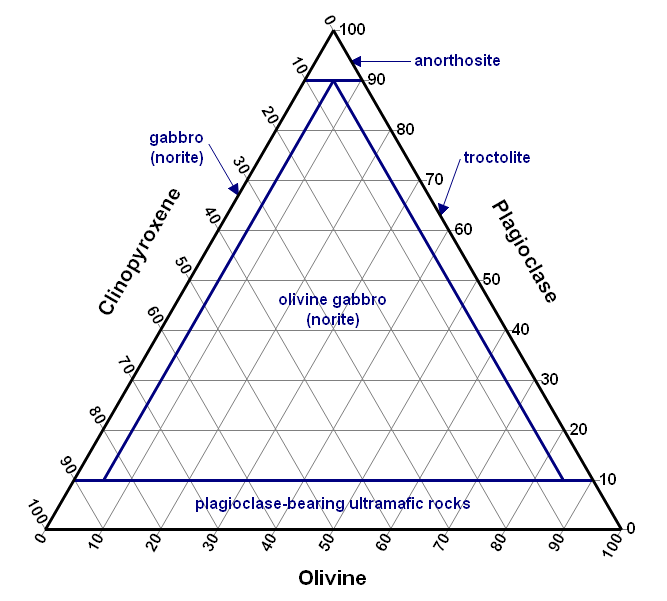 It is most often used in geologic studies to show the relative compositions of soils and rocks, but it can be more generally applied to any system of three variables. The proportions of the three variables plotted always sum to some constant. In DPlot that constant is always the value 100. Because the 3 values for any point always sum to a constant, any one variable is not independent of the others so only two variables must be known. Each vertex of the triangle represents a 100% proportion of the variable to the left, and 0% of the variable to the right side of the vertex. As a proportion increases in any one variable, the point representing that sample moves from the base to the opposite point of the triangle. 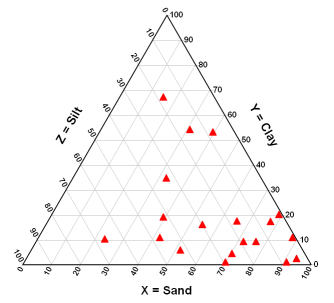 In DPlot the X values are used for the horizontal scale, Y values are used for the right side of the triangle, and Z values (left side of the triangle) are forced to 100-X-Y. 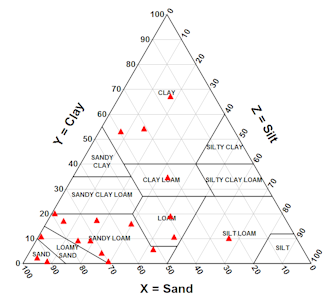 If your data is composed of sand and clay percentages from a soil texture analysis (with the third implied axis being silt percentage), then you may desire to display the graph using the USDA soil classifications. This option divides the graph into the 12 regions of USDA-specified soil textures and labels each region. To use this option, right-click on the graph, select "Triangle Plot Options", then check the "Draw USDA Soil Classifications" box. In this example we've also checked the "Clockwise Orientation" box (by default the graph is drawn with numbers increasing in a counterclockwise direction, with the Y values on the right side of the plot). 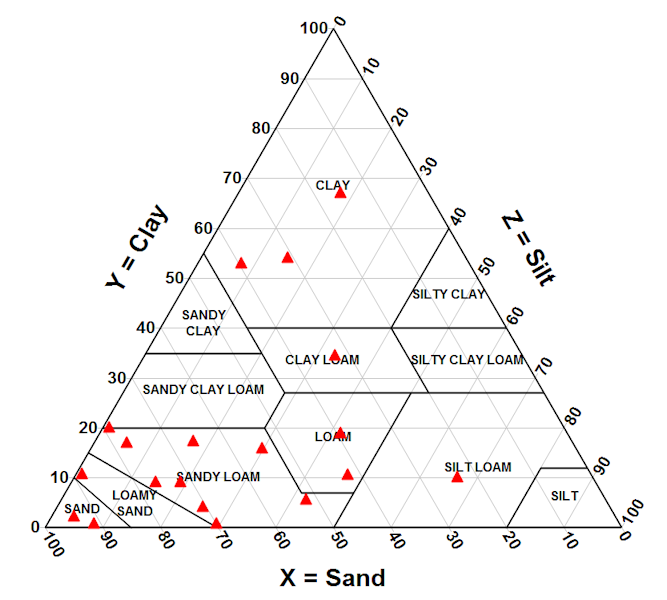 If your data is sand, clay, and/or silt percentages but is not ordered correctly for this plot, you can perform one or two simple swapping operations such that the graph will have the correct orientation for this option. 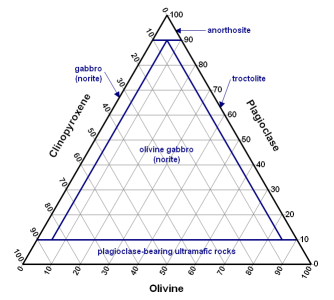 DPlot also includes support for IUGS (International Union of Geological Sciences) mafic and ultramafic rock classifications and Ab-An-Or (Albite, Anorthite, Orthoclase) mineral classifications. For mafic rock, the X values are assumed to be Olivine percentage, Y values are assumed to be Plagioclase percentage, and the inferred Z values are Pyroxene percentage. 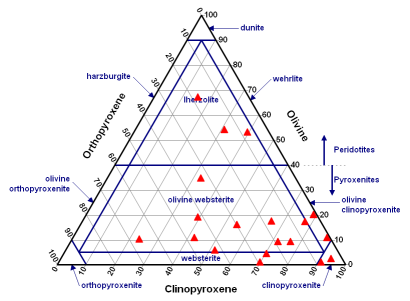 For ultramafic rock, X values are assumed to be Clinopyroxene percentage, Y values are assumed to be Olivine percentage, and the inferred Z values are Orthopyroxene percentage. 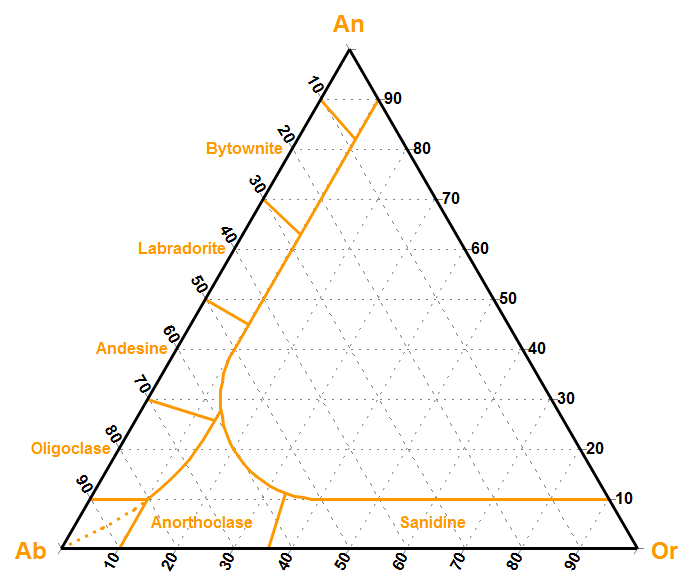 For Ab-An-Or plots, X values are assumed to be Orthoclase percentage, Y values are assumed to be Anorthite percentage, and the inferred Z values are Albite percentage. 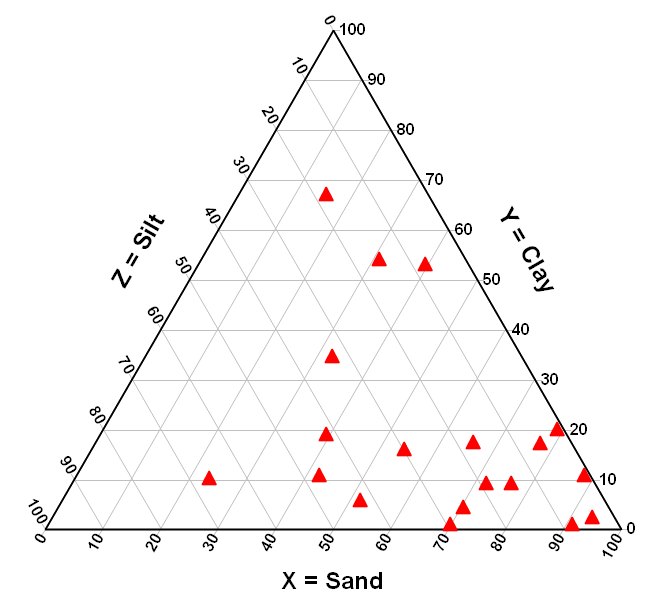 In general you can plot any sort of boundaries and/or labels you want with a ternary plot. For an example see the blog entry on this subject. If you have a plot classification that you think might be of use to others, please let us know and you'll likely see that option in a future release. Tip: Most moderate-sized non-bold fonts will have a pronounced aliasing problem at orientations other than horizontal or vertical on your display. They're ugly, in other words. For triangle plots this pertains to the numbers along the X and Z axes. The equivalent bold font will generally have a better appearance in this case. This applies mainly to the display and saved bitmaps; printed fonts will generally look good regardless of the orientation or font weight. Need another scale? Let us know and we can most likely fix you up in a short turnaround.